Back row L to R: Team advisor Betsy Hillery, Nicole Brewer, Jessi Lanum, Heidi Anderson, Lev Gorenstein. Front row L to R: Jenett Tillotson, Jia Cheoh, HyeJin Kim, Claudia Li. Young women interested in pursuing computer science have six new role models: the members of Purdue’s first all-women student supercomputing team. The team, known as Ada Six in honor of Ada Lovelace, the first computer programmer, will compete in the Student Cluster Competition at the upcoming SC18 supercomputing conference. 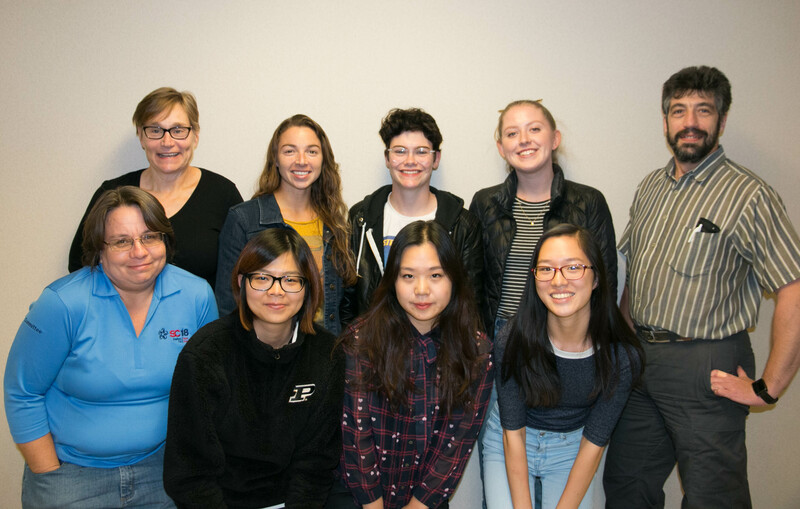 Purdue’s Women in High-Performance Computing group organized the team, which is advised by Betsy Hillery, ITaP Research Computing manager for high-performance computing services, with support from other ITaP Research Computing staff members. The Ada Six team members are all Purdue undergraduates majoring in STEM fields, who have spent the last six months sharing their technical expertise with each other and getting an in-depth introduction to high-performance computing that few undergraduates have the chance to experience. HyeJin Kim, a senior triple majoring in math, computer science and statistics from Changwon, South Korea, echoes Brewer’s comments, adding that “working with teammates from other fields and learning things we’d never learn in the classroom” has been her favorite part of the experience so far. With help from their sponsors, Dell EMC, Nvidia and Mellanox, Ada Six built their own supercomputer, on which they’ll run a variety of real-world scientific software applications, including a mystery application that won’t be announced until the competition gets underway. They’ll be evaluated based on how much science they can accomplish during the 48-hour challenge, while staying under a specified power limit. Jessi Lanum, a sophomore in cybersecurity from San Bernardino, Calif., was interested in learning more about machine learning, so she chose to specialize in Horovod, one of the known applications and Uber’s open source distributed deep learning framework. She’s confident the problem-solving skills she’s developed with help from ITaP Research Computing staff will be key to cracking the mystery app. At SC18, which takes place in Dallas, Texas from Nov. 11-16, the Purdue students will compete in the cluster challenge, but they’ll also have the chance to take in other aspects of the conference, including lectures about high-performance computing, a mentoring program and a job fair, which is of particular interest to the graduating seniors. The team members are all excited about meeting their peers from other institutions. “Seeing the many different approaches to the same problems we’ve had to face will be the best learning experience,” says Claudia Li, a sophomore in neurobiology from West Lafayette. Jia Cheoh, a senior in computer science from Kuala Lumpur, Malaysia, adds that she’s looking forward to meeting like-minded people who are equally passionate about high-performance computing. Of the 16 teams from around the world competing in Dallas, Ada Six will be the only team made up exclusively of women. Being part of an all-women squad has been a special experience, the team members say. “It gives us a closer bond, because we have the shared experience of being women in science and technology,” says Heidi Anderson, a junior in computer science from Saratoga, Calif. Writer: Adrienne Miller, science and technology writer, Information Technology at Purdue (ITaP), 765-496-8204, mill2027@purdue.edu.